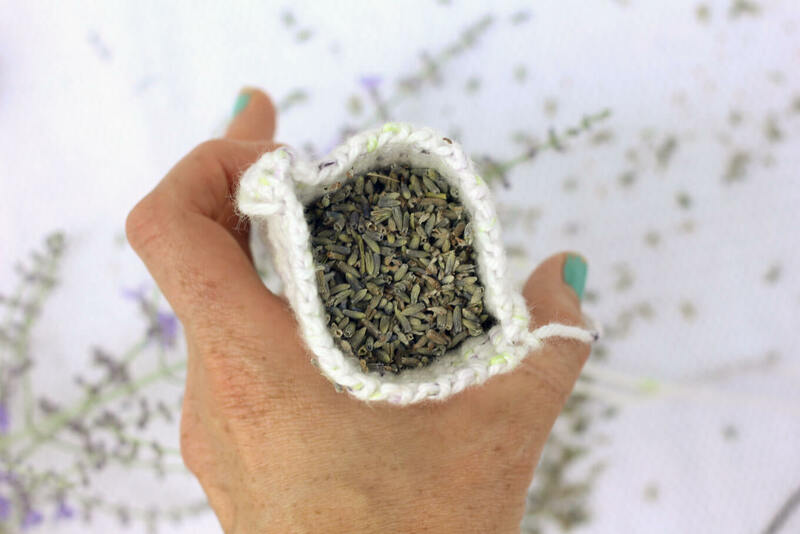 Pop one of these crochet dried lavender sachets with your laundry in the dryer and you’ve got natural and inexpensive way to keep your laundry smelling fresh! As I’ve mentioned before, we can be pretty crunchy around here. I grew up with hippie parents (how do you think I learned how to crochet as a young child? From a mom who had spent the decade before I was born making granny square vests, of course!) and now being a parent myself, I suppose I’ve become more aware of avoiding toxins and keeping our life as chemical-free as possible. So if you’re wondering, I DO wear deodorant. But, we don’t use fabric softener. We just stopped one day and never started again. We just got used to stiffer clothes, I guess. But crispy jeans or not, it’s still nice to have your laundry come out of the dryer smelling fresh and clean. That’s where the loads of lavender buds growing in your garden come in! 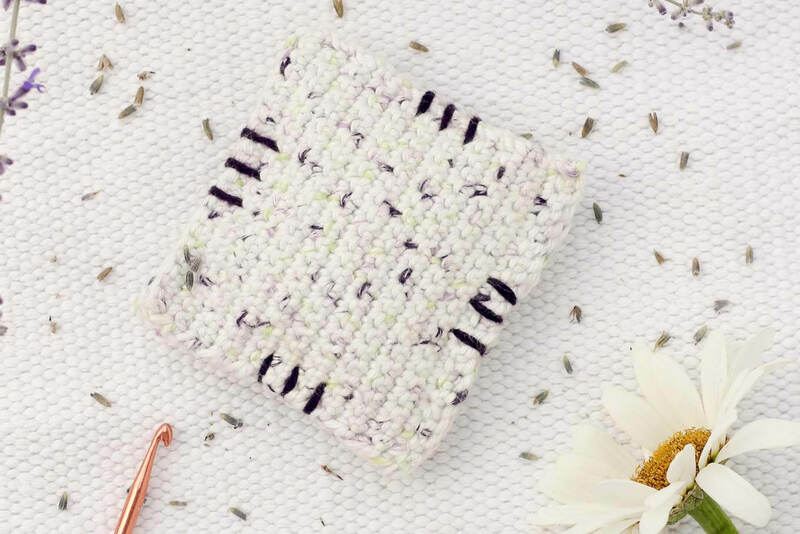 As soon as those flowers are past their prime, you can start saving them for these sweet little crochet sachets that can be tossed in the dryer with each load. You can also just place them in your drawer to keep your clothes smelling nice while they’re waiting to be called to active duty. And if you’re like me and don’t actually have a lavender plant in your garden, you can buy the dried buds at Trader Joe’s or on Amazon. This pattern is about as simple as they come. 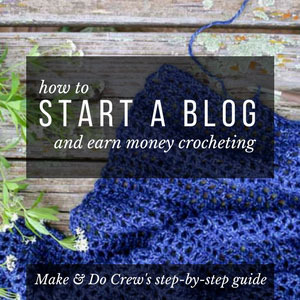 Nothing but single crochet here, which makes it great for beginners. The most important thing to get right is your hook size, because while the gauge doesn’t matter, you want your sachet to have a tight enough weave that no lavender buds can escape. You may make items to sell with this pattern. Please read these policies carefully first. 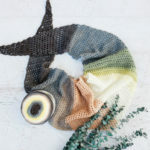 So you can spend more time crocheting and gardening and less time shopping, this post contains affiliate links at no extra cost to you. Row 1: ch 21; turn. Repeat row 3 until piece height measures the same as its width. Example in the photo is 4.5”x4.5”. Fasten off. Repeat for a second square. 1. I spritzed my squares with water and blocked them using my $2 DIY blocking board for about an hour before sewing them together. This is optional. 2. Press your squares together. 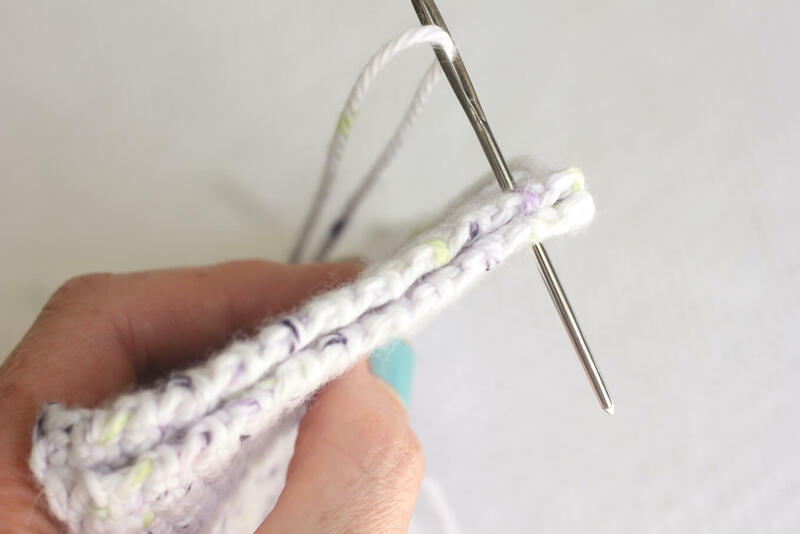 Using a running stitch (the same stitch you would normally use to hand sew a piece of fabric–just a basic in and out in a straight line), sew along the edge of three sides. 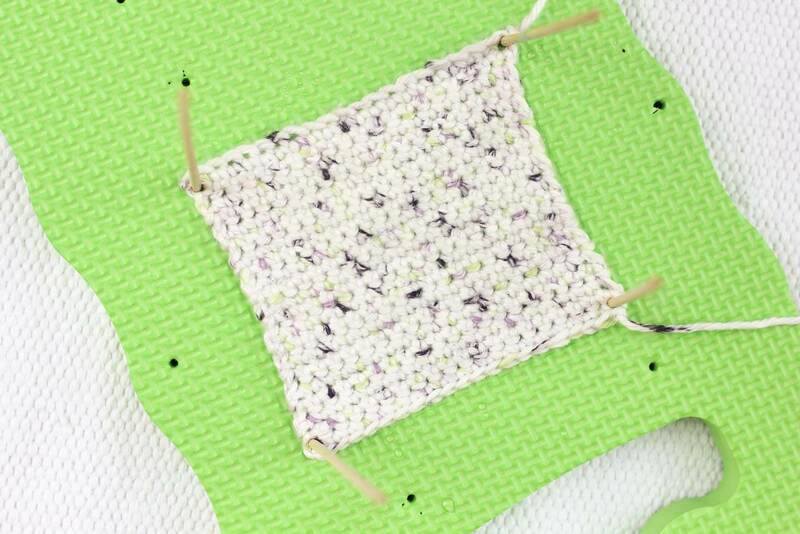 Keep your stitches pretty close together so that there are no gaps that the lavender can sneak out of. 3. 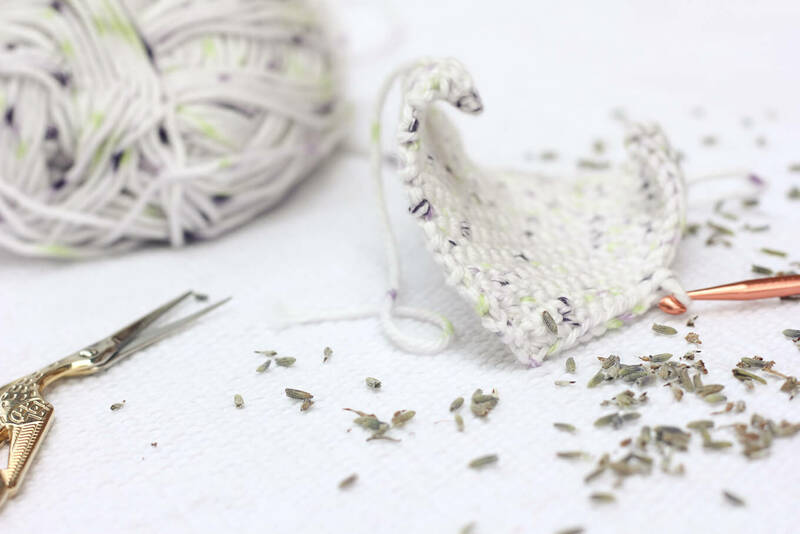 Fill your crochet pouch with dried lavender buds. 4. Sew the last edge in the same way you worked the others. Fasten off. 5. 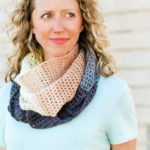 To add the accent embroidery, thread your tapestry needle and tie a decent-sized knot in the end of your accent yarn. 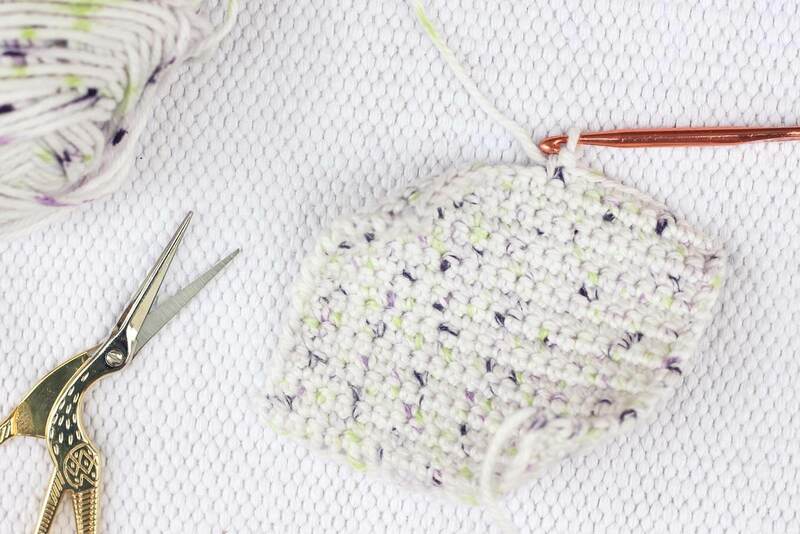 Use your fingernail or a small crochet hook to work the knot through one of the side seams so that it’s hidden inside your sachet. Embroider three lines per sachet edge. To move between the sides, I just guided my needle through the middle of the sachet and popped it out where I wanted to start the next set of lines. When you’re finished, tie another pretty big knot and work it through the fabric to hide it away. There you go! 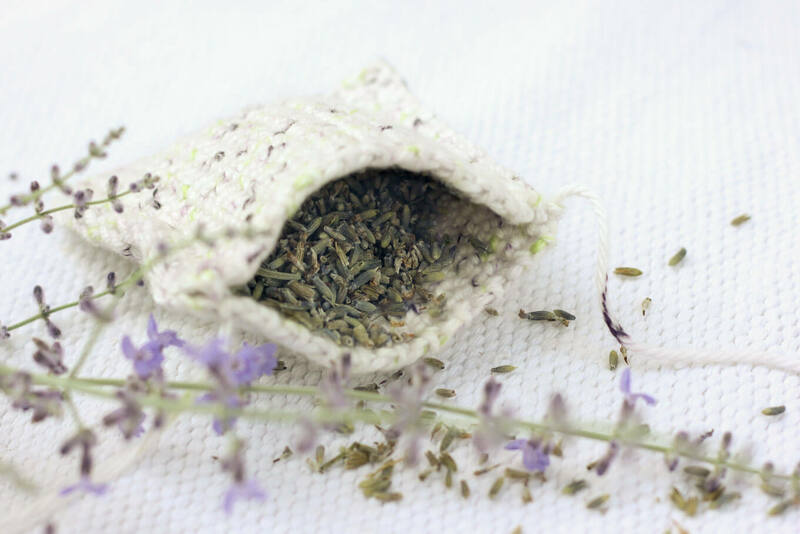 At their best, these little lavender sachets make a great DIY gift. And at the very least, they might be a good incentive to go start a load of laundry. I personally need all the help I can get in that category. 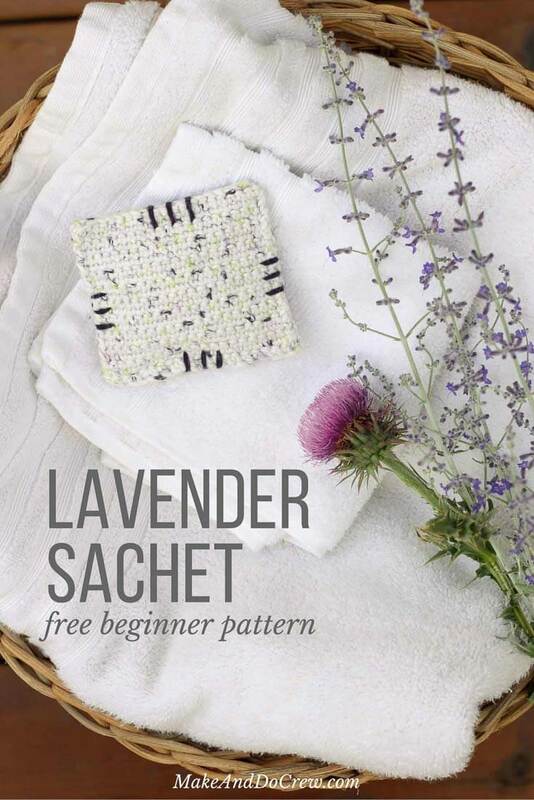 If you enjoyed this free lavender sachet pattern, please consider sharing it! 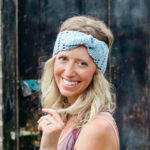 Each person that visits this site helps me continue to create free patterns. Thank you! 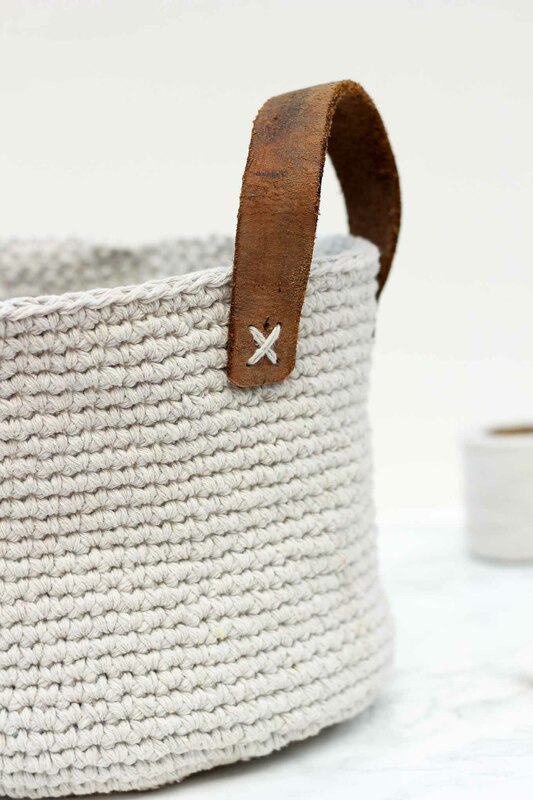 Now that your laundry routine is getting a little love, you might like to make this dollar store twine basket pattern to store all your laundry-room supplies! I just love lavender sachets. We are growing some lavender in our garden, so I’ll have to try some out in the dryer. You make crocheting look so easy! I love those specks of color in the yarn you chose. Such a fun and useful project! Yay! It’s a great use of lavender, especially if you have your own plant in the garden. I absolutely love this project!!!!! Definitely will be making these for Christmas gifts and of course for personal use. Awesome, Nancy! I do think they’ll make perfect little stocking stuffers for the lucky recipients. silly question . can these b used multiple times ? ? ? i buy my lavender buds so want to put them to the highest output projects . THANK U ! ! ! ! ! looooooove the idea ! ! ! ! They sure can! I think the scent will fade a bit, but you should definitely get multiple uses out of them. Thought maybe you would like to learn that your clothes don’t have to be stiff. (Or perhaps you already know.) You can use white vinegar in the washer & your clothes will be softer after the dryer. Love the sachet idea! I think I’ll try these with some Eucalyptus paper tucked in them. Thanks for sharing. I love the idea of using eucalyptus paper! I have heard that about vinegar. When do you put it in the washer? Just from the get-go on the dry clothes or do you have to add it toward the end during a rinse? Thanks for the advice! Wouldn’t the lavender come out in the drier after a while? Love the idea and thanks for sharing!! Hi. Great pattern and idea! How long do these sachets last?Because I’d hate to throw the bags away. Do you refill it after a while? Thanks.